Me? Dissect frogs? Umm no thank you. Last year my 5th graders were dying to dissect something. Anything. “Please, please Mrs. G!” they would say. I was talking it over with my co-teacher one day and she offered to do it with the kids. Whhhhhattt? I wanted to jump up and down for joy. Listen- I am all about hands-on learning. And I am all about dissection. But teaching it? Having to try it on my own. I just wasn’t so sure. But Mrs. Cahill is fabulous and she is a science goddess and she knew exactly what to do to wrap up our Human Body Unit. And NOW, I recommend giving it a try yourself. Seriously! She made it SO easy and the students loooved it. Skeptical? I don’t blame you, but here’s all you need to do. First you’ll need to order your frogs (I recommend getting worms too because they’re cheap and great practice before starting on the frog). We ordered enough worms for every students and enough frogs for every two students. You can find all sorts of websites selling these guys, but we used HomeScienceTools and absolutely recommend it! The best part is, the worms and frogs come shrink wrapped and can just be stored in a cabinet until you’re ready to use them- no smell, no mess, no fuss! You’ll also need tools– a dissecting pan, scissors, a scalpel, a teasing needle, and pins. You can get kits with more, but these are the absolute basics you’ll want to have and can be found pretty inexpensively. Our school had them on hand so we lucked out! I’ve since discovered that a styrofoam tray, exacto knife, toothpick, and small scissors will work as well. Mrs. Cahill began by discussing the basic safety that goes along with dissection. A basic Safety Contract was sent home for students and parents to sign and in class students watched this great Safety Video. Before we could even start the lesson, Mrs. Cahill had students answer a question in their science notebooks. Why are we dissecting worms and frogs? After students were ready to be safe learners, Mrs. Cahill went over the basic tools and steps involved in dissection. She did this verbally, instead of having the steps written down, so that students had to listen and wouldn’t rush ahead. Starting with worms gave students an idea of how to hold the scalpel, how hard to press when cutting, and what to expect. The worms were MUCH cooler than I had anticipated. You can find “how to” guides online as well as videos. Mrs. Cahill followed these and tried it herself to figure out the steps, then wrote down steps that worked for our class. She used those steps to instruct our learners. The frogs took a little longer and were a little more difficult- but full of some amazing information!! Some students even found food in the stomach of their frog- Talk about unforgettable learning experience. After the dissections, students reflected on the experience. You can pick up a Dissection Reflection here! This helps students think about the activity and put some knowledge to it. Okay, so it took some work- but dissecting frogs was beyond worth the prep. I will absolutely be doing this in the years to come! It really taught me not to hesitate about doing a lesson just because it’s outside of my comfort zone. I hope it helps you too 🙂 Thanks Mrs. Cahill!! 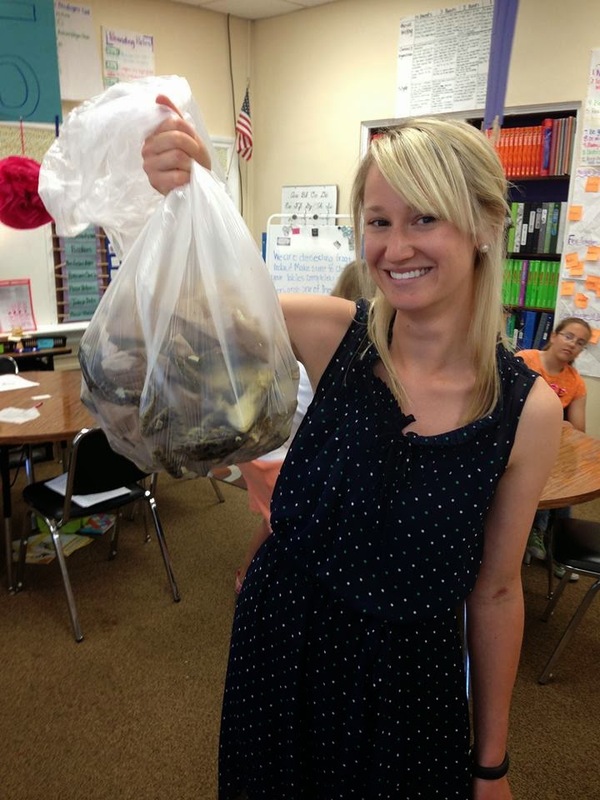 After our dissections… me holding a bag of dissected frogs- yikes!